BERKELEY, Calif. (KGO) -- BART and Berkeley police cleared out part of a homeless encampment Wednesday morning. 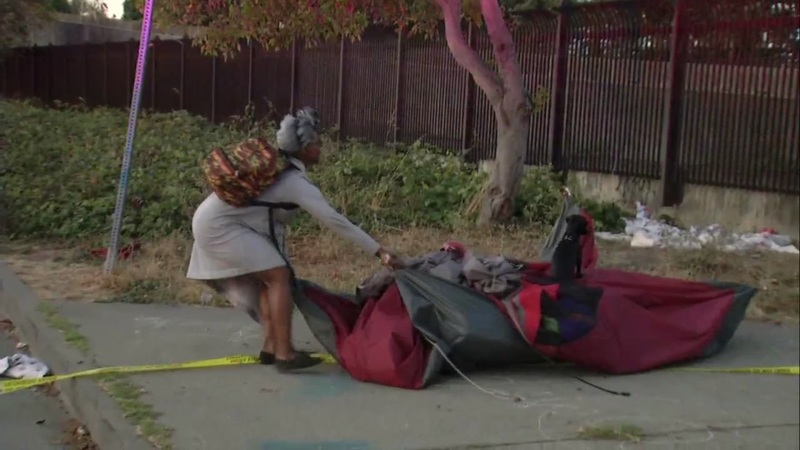 The section of the camp near 63rd and Martin Luther King near the BART tracks was left untouched after a court order was filed to halt the eviction process. "They started asking us to get up, get our stuff and leave the premises," one resident of the encampment said. Notices to leave within 72 hours were posted Saturday at camps on both sides of the tracks. People living on the west side filed that court order to delay the eviction, while those on the east side did not. About a dozen people did not leave the east camp before the deadline. James Davis Senior was one of them. "I'm kinda like confused, because this is the first time I've ever been through something like this," he said. BART employees wore hazmat suits, masks and gloves to remove the belonging left behind. Several dump trucks were brought in and fences were erected to keep trespassers off the property. "Everyone was very cooperative and left without any incidents, there were no arrests," BART Spokesperson Jim Allison said. BART spokesperson Jim Allison says this land has always belonged to BART, but it's been maintained by the City of Berkeley since 1969. Recent complaints by a nearby school prompted today's eviction. A hearing on the west camp's eviction is set for Tuesday October 31.